James Stewart established himself as a leading actor with this film, the one he is perhaps most identified with - and it was the fifth film he made in 1939. He was again teamed with his co-star Jean Arthur (in the role of a cynical secretary) from the previous year's Best Picture winner, Capra's You Can't Take It With You (1938). Stewart's character represents the powerful forces of American freedom, democracy and morality over oppression and evil in his emotional portrait of a naive, idealist, patriotic young politician who, after being sent to Washington (a symbol of liberty and democracy) as a junior senator from an un-named state, matures in wisdom, fights political corruption within his state's political machine, and guards American values as a moral hero. The film is enhanced by a travelogue-montage of tourist sights in the nation's capital, and Dimitri Tiomkin's medly of flag-waving Americana songs ("Yankee Doodle," "My Country 'Tis of Thee," "Red River Valley," and "When Johnny Comes Marching Home"). Production work included reconstructing a perfect replica of the Senate chamber, and the film was faithful to how American democracy works (i.e., how a bill becomes a law, political machines, filibustering, etc.). The wonderfully-acted, absorbing and human film was popular at the box-office and critically successful too. 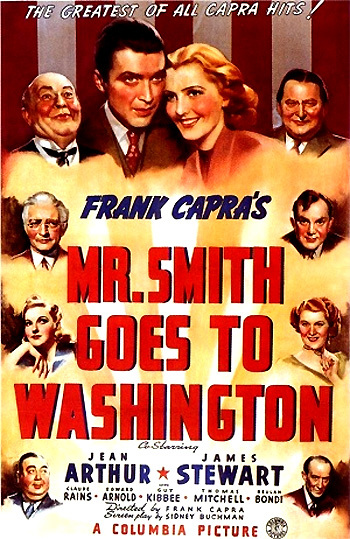 However, the film caused some controversy and pressure was brought to bear to hinder its release (two months after the outbreak of WWII in Europe), due to the fact that Capra's film was propagandistic, depicted political corruption, and appeared to paint an anti-democratic picture of the US government and its inner workings. But the film also called for faith in traditional American values of patriotism and faith in the people, and provided an educational lesson in how bills are passed through Congress. Capra's film received eleven Academy Award nominations, including Best Picture, Best Director, Best Actor (James Stewart), Best Supporting Actor (Harry Carey and Claude Rains), Best Score (Dimitri Tiomkin), Best Sound Recording (John Livadary), Best Film Editing, Best Interior Direction (Lionel Banks), Best Screenplay (Sidney Buchman), and Best Original Story. However, 1939 was a banner year for great films, so its sole award went to Lewis R. Foster for his original story - originally a novel titled The Gentleman from Montana. In 1940, Stewart was awarded the Best Actor Oscar for his lesser role in The Philadelphia Story (1940), often considered a consolation prize for his loss in this year. Senator Samuel Foley - dead, yeah, yeah, died a minute ago - here at St. Vincent's. At the bedside was state political sidekick Senator Joseph Paine. Yeah. Senior Senator Joseph Harrison Paine (Claude Rains) calls long-distance for Governor Hubert "Happy" Hopper (Guy Kibbee) and relays the news. Hopper calls party Boss/media magnate Jim Taylor (Edward Arnold), to receive instructions on the choice of a successor (Hopper reveals in his conversation that his strings are pulled by the ruthless Taylor - he is Taylor's yes-man). The Jackson City Star newspaper headlines announce: "GOV. HOPPER'S CHOICE IS EAGERLY AWAITED." Hopper must rely on the advice of the political boss' machine to suggest someone to serve as interim senator to complete the dead senator's term. ...the man who goes to the Senate to take Sam Foley's place can't ask any questions or talk out of turn. We've got to be absolutely sure of him. We've been quietly buying up all the land around that dam, and holding it in dummy names. If we drop it now or even delay it, it will bring about an investigation. The investigation will show that we're going to sell it to the state under phony names. Now it's my judgment, the smartest thing for us to do is to push this dam through just the way it's going and get it over with. Taylor's first suggestion for the appointment, Hon. Horace Miller, an avowed "born stooge," is flatly rejected by the voters: "He's Taylor's man. A party man. He's Taylor's stooge!" A second candidate, Henry Hill is proposed, but Taylor rejects him as a "crackpot, that longhead." Not knowing who to appoint, the beleaguered, weak-willed, crooked, boss-controlled Governor Hopper is "attacked and belittled" by the advice of his bratty children that evening during a family dinner. They suggest the popular head of the state's Boy Rangers, Jefferson Smith (an 'Everyman' name, played by James Stewart), who is heroically responsible for single-handedly putting out a terrific forest fire around Sweetwater: "the biggest expert we got, wild game, animals...and right now, he's the greatest hero we ever had. It's all over the headlines." One of the other youngsters claims that Smith is an American patriot and publisher of the well-read Rangers' boys publication: "He's the greatest American we got too, Dad. He can tell you what George Washington said, by heart. And Boy's Stuff's got the swellest stuff in it." To settle the matter between his two choices (Miller or Hill), Hopper flips a coin. When the coin stands on edge and he happens to see an article praising Jeff Smith's heroics, he decides to appoint Smith - a harmless choice (and hence, easily controllable as a puppet). Hopper arrives at the Boy Rangers Headquarters, where he glimpses the backside of Jefferson Smith conducting the Rangers' boy's orchestra. The next day's headlines in the Jackson City Star announce the appointment: "GOVERNOR NAMES YOUTH LEADER TO U.S. SENATE," "BOYS' CLUBS OF STATE ELATED," and "SMITH APPOINTMENT POLITICAL SURPRISE." ...a big-eyed Patriot, knows Lincoln and Washington by heart, stands at attention in the Governor's presence, even collects stray boys and cats...a perfect man, never in politics in his life, wouldn't know what it was all about in two years, let alone two months. And the important thing - and this was the genius of the stroke - it means votes. A hero of 50,000 boys, and a hundred thousand parents. Senator Paine, under the powerful thumb of the machine's Boss Taylor, is confident that Smith will be a yes-man and not conflict with their crooked legislation or ask any embarrassing questions while quietly sight-seeing during his brief stay in Washington, D.C.
A young patriot, recites Lincoln and Jefferson, turned loose in our nation's capital. Yeah. I think it's all right. A "star-spangled banquet" is held to honor the new appointment and provide a proper send-off - the honor is given not to "some wealthy influential citizen merely to curry favor" or to an "unworthy political hireling." The Governor explains his own decision: "He went down among the people, and there he found a nugget." Just to sit here with him is a very great honor for me, because I remember Dad used to tell me that Joe Paine was the finest man he ever knew. I don't think I'm gonna be much help to ya down there in Washington, Senator. I'll do my best. With all my might, I can promise ya one thing - I'll do nothing to disgrace the office of the United States Senate. A representative from the Boy Rangers' marching band presents him with a briefcase and then the room bursts into song with "Auld Lang Syne," as tears come to Jeff Smith's eyes. Dad always used to say the only causes worth fighting for were the lost causes. I suppose, Mr. Paine, when a fella bucks up against a big organization like that, one man by himself can't get very far, can he? Smith: Things sure happen fast around here, don't they? Chick McGann (Eugene Pallette): Yeah, you'll have to get yourself out of low gear, Senator. Daniel Boone's lost...Lost in the wilds of Washington...The Boy Ranger, aw, he'll show up. He must have a compass with him. On his impromptu, whirlwind sightseeing bus tour of the capital city's sites and monuments in a compiled montage of images (edited by famed director/editor Slavko Vorkapich), Smith gazes at the words "EQUAL JUSTICE" carved on the Supreme Court Building, the White House, Constitution and Pennsylvania Avenues. He is swept up in the glories of the nation's capital - inside the Capitol Building, he stands in awe before a statue of Thomas Jefferson - author of the Declaration of Independence and the Constitution of the United States. As a gigantic Liberty Bell clangs, more montage images are super-imposed in close-up - the penned words "Life, Liberty" and "Pursuit of Happiness," flames of freedom, and statues of the founding figures of Samuel Adams and Hamilton. Smith also gapes at the Washington Monument pointing up into the sky. More images fill the montage: a bust of George Washington, a bald eagle, a War Memorial, and the Tomb of the Unknown Soldier at Arlington National Cemetery. The camera circles around the Lincoln Memorial. He walks up to view the imposing seated statue of a solemn-faced Lincoln in front of him, reading the inscribed words of Lincoln's most famous speeches. In a memorable sequence, he overhears a young grandson (assisted by his grandfather) reading outloud part of the Gettysburg Address from the inscription. Smith reverently views the touching scene with patriotic pride. An elderly black man with his hat against his chest also looks up reverently. When Foley died, why didn't I clear out? How many times have you heard me say, 'I'm fed up with politics' ? No, I let 'em talk me into staying. Secretary to a leader of little squirts. Why? Because I need the job and a new suit of clothes. My dear Senator, it may be customary out on the prairie to take French leave of people and not show up for five hours. I don't think I've ever been so thrilled in my whole life, and that Lincoln Memorial! Gee Whiz! And Mr. Lincoln, there he is. He's just lookin' right straight at ya as you come up those steps. Just, just sitting there like he was waiting for somebody to come along. During the taxi ride with Saunders to Senator Paine's office, he gestures out the back window at the Capitol Dome, flooded with lights. Smith plans to spend the next morning at George Washington's Mount Vernon home to "get in the mood" for taking his Senate seat at noon when the session convenes. Well, I'm still asking myself what is he - animal, vegetable, or mineral?...When I think of myself sitting around playing straight for that phony patriotic chatter. Me! Carrying bibs for an infant with little flags in his fist. I- I can't take it Diz. I quit. I'm through. Smith reveals his crush on Senator Paine's daughter Susan, and then entertains them by performing well-practiced bird calls. Pictures and mocking headlines in the next day's newspapers ridicule the novice's antics - he is seen in clownish, awkward poses making bird calls and Indian signs, and starting a fire by friction. Saunders: Look Senator, I wasn't given a brain just to tell a Boy Ranger what time it is. Paine: Don't be a fool, Saunders. If certain things happen, I'm taking everybody up with me and you'll get one of the biggest jobs in Washington. Saunders: Look, when I came here, my eyes were big blue question marks. Now they're big green dollar marks. Paine: Smart girl, eh? Alright, finish this job properly and you get a handsome bonus. And by properly, I mean keep Smith away from anything that smacks of politics. Saunders: Including Willet Creek Dam? Paine: Including Willet Creek Dam. Now go back to your work! Diz: See you got Daniel Boone in all right. Saunders: Daniel in the lion's den. I refer to his astounding and shameless performance for the newspapers - a versatile performance, I grant you...but one that brings his rank down to the level of a sideshow entertainer and reflects on the sincerity if not the sanity of the highest body of lawmakers in the land. My colleague was innocent in the matter referred to. He was completely misquoted. I know Jefferson Smith, and I will personally vouch for him. He has the greatest possible respect for his office and for these gentlemen. Sweeney (Jack Carson): How do you want it Senator? Dished out or in a bottle? Smith: People in this country pick up their papers and what do they read? Diz: Well, this morning, they read that an incompetent clown had arrived in Washington, parading like a member of the Senate. Smith: If you thought as much about being honest as you know about being smart. Diz: Honest? Why, we're the only ones who can afford to be honest in what we tell the voters. We don't have to be re-elected like politicians. Sweeney: For instance, we tell 'em when phonies and crack-pots come here to make their laws. Reporter: If it's the truth you want, what are you doin' in the Senate? Reporter: What do you know about laws or making laws or what the people need? Smith: I don't pretend to know. Diz: Then what are you doing in the Senate? Sweeney: What's he doing? Well, honorary appointments. Reporter: The country needs men up there who know and have courage as it never did before. He's just gonna decorate a chair and get himself honored. Reporter: And that he votes, sure, just like his colleague tells him to. Diz: Yes sir, like a Christmas tiger, he'll nod his head and vote 'YES.' You're not a Senator. You're an honorary stooge. You ought to be shown up.